Palestinian rabbi and author; born at Jerusalem in 1671; died at Safed after 1750. His father, Jacob Ḥagiz, died while Moses was still a child. The latter was therefore educated by his maternal grandfather, Moses Galante the younger, who had succeeded his son-in-law. With the death of Moses Galante (1689) support from Leghorn was withdrawn, and Ḥagiz found himself in very straitened circumstances. He went to Safed to collect a claim which his mother had against the congregation, but succeeded only in making bitter enemies, who later persecuted him. Returning to Jerusalem, he was given letters of recommendation, through which he expected to obtain support for a bet ha-midrash which he intended to establish. 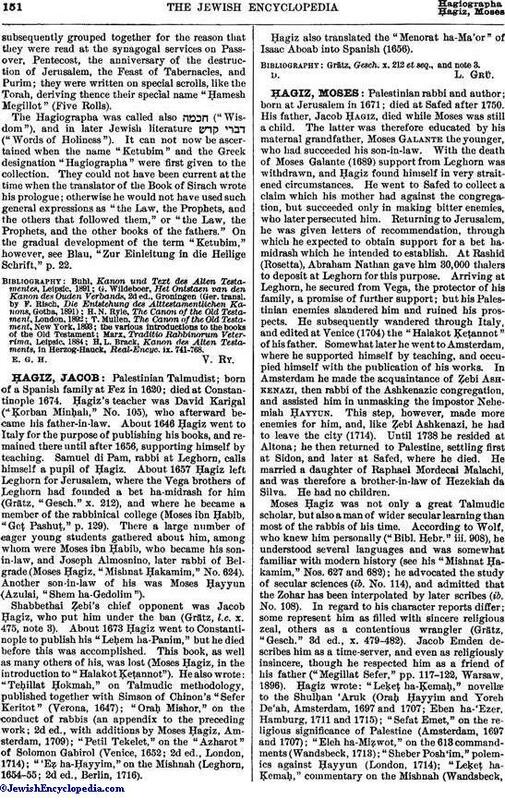 At Rashid (Rosetta), Abraham Nathan gave him 30,000 thalers to deposit at Leghorn for this purpose. Arriving at Leghorn, he secured from Vega, the protector of his family, a promise of further support; but his Palestinian enemies slandered him and ruined his prospects. He subsequently wandered through Italy, and edited at Venice (1704) the "Halakot Ḳeṭannot" of his father. Somewhat later he went to Amsterdam, where he supported himself by teaching, and occupied himself with the publication of his works. In Amsterdam he made the acquaintance of Ẓebi Ashkenazi, then rabbi of the Ashkenazic congregation, and assisted him in unmasking the impostor Nehemiah Ḥayyun. This step, however, made more enemies for him, and, like Ẓebi Ashkenazi, he had to leave the city (1714). Until 1738 he resided at Altona; he then returned to Palestine, seṭtling first at Sidon, and later at Safed, where he died. He married a daughter of Raphael Mordecai Malachi, and was therefore a brother-in-law of Hezekiah da Silva. He had no children. Moses Ḥagiz was not only a great Talmudic scholar, but also a man of wider secular learning than most of the rabbis of his time. According to Wolf, who knew him personally ("Bibl. Hebr." iii. 908), he understood several languages and was somewhat familiar with modern history (see his "Mishnat Ḥakamim," Nos. 627 and 682); he advocated the study of secular sciences (ib. No. 114), and admitted that the Zohar has been interpolated by later scribes (ib. No. 108). In regard to his character reports differ; some represent him as filled with sincere religious zeal, others as a contentious wrangler (Grätz, "Gesch." 3d ed., x. 479-482). 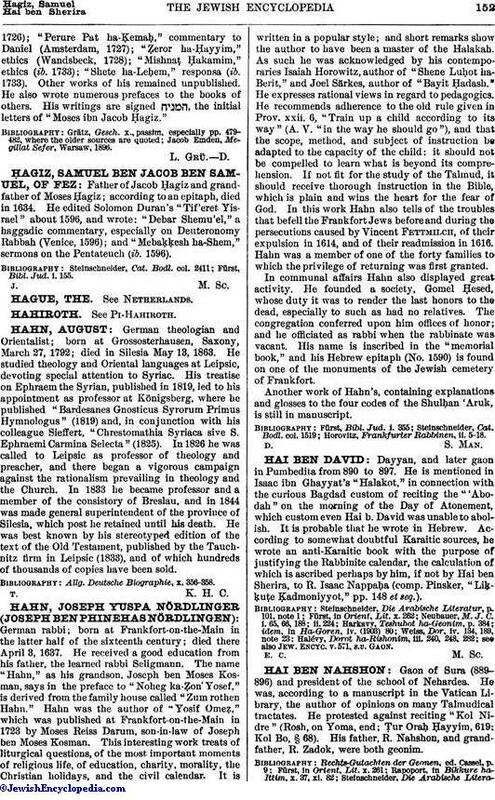 Jacob Emden describes him as a time-server, and even as religiously insincere, though he respected him as a friend of his father ("Megillat Sefer," pp. 117-122, Warsaw, 1896). Ḥagiz wrote: "Leḳeṭ ha-Ḳemaḥ," novellæ to the Shulḥan 'Aruk (Oraḥ Ḥayyim and Yoreh De'ah, Amsterdam, 1697 and 1707; Eben ha-'Ezer, Hamburg, 1711 and 1715); "Sefat Emet," on the religious significance of Palestine (Amsterdam, 1697 and 1707); "Eleh ha-Miẓwot," on the 613 commandments (Wandsbeck, 1713); "Sheber Posh'im," polemics against Ḥayyun (London, 1714); "Leḳeṭ ha-Ḳemaḥ," commentary on the Mishnah (Wandsbeck,1726); "Perure Pat ha-Ḳemaḥ," commentary to Daniel (Amsterdam, 1727); "Ẓeror ha-Ḥayyim," ethics (Wandsbeck, 1728); "Mishnaṭ Ḥakamim," ethics (ib. 1733); "Shete ha-Leḥem," responsa (ib. 1733). Other works of his remained unpublished. He also wrote numerous prefaces to the books of others. His writings are signed , the initial letters of "Moses ibn Jacob Ḥagiz." Jacob Emden, Megillat Sefer, Warsaw, 1896.